Obama's Afghanistan Speech Rehearses His Re-Election Themes : It's All Politics The president clearly wanted to communicate that he shared the desire of many Americans that their government stop spending hundreds of billions of dollars on wars even as the nation faces a fiscal crisis. He spoke to the strong and growing sense that all that money could be better spent at home. 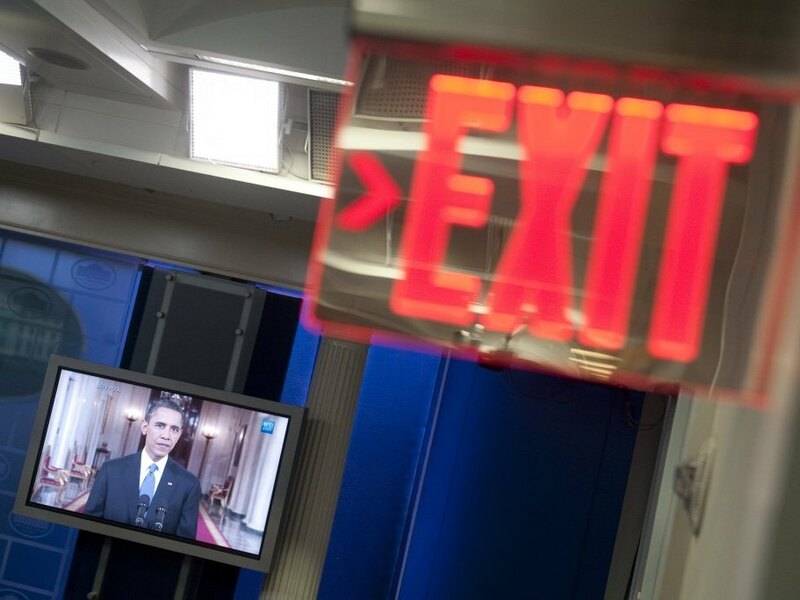 A television monitor in the White House briefing room displays President Obama as he discusses his Afghanistan exit strategy, June 22, 2011. When a democracy wages war, the most important weapon in its arsenal is the willingness of its people to make the necessary sacrifices of blood and treasure. But the American people have increasingly indicated through public-opinion polls that the Afghanistan War is losing their support. With his campaign for re-election already underway President Obama, in his Wednesday evening speech on his planned drawdown of U.S. troops in Afghanistan, needed to address the war weariness of voters as well as their concerns for an economy not producing enough jobs, and a ballooning national debt. Meanwhile, the president also had to argue that the situation in Afghanistan had improved so much he could withdraw the 30,000 troops that comprised the U.S. military's surge into that nation. Ten thousand will come out by the end of 2010, the balance by the end of summer 2012 which, by happenstance, is several weeks before the U.S. general election. So not only can the light at the end of the tunnel now be seen but the tunnel itself ends in 2014 when the transition from NATO to Afghan security forces is to be completed, Obama said. In the speech, the president rehearsed some of the key themes that he will likely use for months to come as he argues that he should be re-elected. He warned against isolationism, an allusion to statements from lawmakers in both parties but especially some of the Republican presidential candidates who'd like to oust him. Already this decade of war has caused many to question the nature of America's engagement around the world. Some would have America retreat from our responsibility as an anchor of global security, and embrace an isolation that ignores the very real threats that we face. Others would have America over-extend ourselves, confronting every evil that can be found abroad. We must chart a more centered course. Like generations before, we must embrace America's singular role in the course of human events. But we must be as pragmatic as we are passionate; as strategic as we are resolute. When threatened, we must respond with force – but when that force can be targeted, we need not deploy large armies overseas. When innocents are being slaughtered and global security endangered, we don't have to choose between standing idly by or acting on our own. Instead, we must rally international action, which we are doing in Libya, where we do not have a single soldier on the ground, but are supporting allies in protecting the Libyan people and giving them the chance to determine their destiny. But Obama also clearly wanted to communicate his desire, shared with many Americans, that their government stop spending hundreds of billions of dollars on wars while the nation faces a fiscal crisis. He spoke to the strong and growing sense that all that money could be better spent at home. That desire among the electorate is one Republican White House hopefuls are tapping into as they respond to the Tea Party movement's desire for deep government-spending cuts. That sentiment is growing among many of the president's fellow Democrats as well. They see cuts real and threatened to cherished social programs while billions of taxpayer dollars are spent weekly in Afghanistan on a mission with an uncertain outcome. Above all, we are a nation whose strength abroad has been anchored in opportunity for our citizens at home. Over the last decade, we have spent a trillion dollars on war, at a time of rising debt and hard economic times. Now, we must invest in America's greatest resource – our people. We must unleash innovation that creates new jobs and industry, while living within our means. We must rebuild our infrastructure and find new and clean sources of energy. And most of all, after a decade of passionate debate, we must recapture the common purpose that we shared at the beginning of this time of war. For our nation draws strength from our differences, and when our union is strong no hill is too steep and no horizon is beyond our reach. "The time has come to make the difficult decision. Charity begins at home. We can no longer afford to rebuild Afghanistan and America. We must choose. And I choose America."